Almost 3000 words. It took 32 oz of coffee before I finally finished this mammoth of a post. ItÃ¢â‚¬â„¢s finished and you can find it on at WoW Insider. Are you on your coffee break? DonÃ¢â‚¬â„¢t have much time to read it? Want to know what I have to say in 30 seconds? Why Slides? I have a presentation to deliver in another month. I wanted to get familiar with Keynote. IÃ¢â‚¬â„¢ve been dying to try out Slideshare for the longest time. I only spent about 90 minutes on this TLDR version (Too Long, DidnÃ¢â‚¬â„¢t Read). ThereÃ¢â‚¬â„¢s even the option of synching audio tracks with slides. Screw podcasts! I might just start a slidecast! Nothing fancy, mostly images and words (90 minutes, right?). Presenting and public speaking are two important academic skills. I do have a presentation to give next month in front of my peers (ItÃ¢â‚¬â„¢s Criminology related). IÃ¢â‚¬â„¢m going to need time to learn and design accordingly. 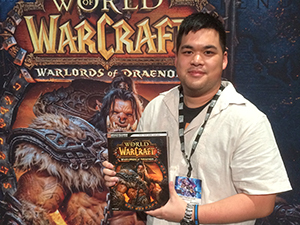 I’ve joined ranks with one of the top WoW blogs in the community: WoW Insider. Their Spiritual Guidance section had been inactive for a while. I’d be lying if I said I wasn’t the least bit nervous. I think the team also needs more Canadian representation! But you long time readers know me well enough to know that I never give anything less than 110 %. As I write this, I have a lot of ideas written down on my whiteboard. But that doesn’t mean I’m not open to anything else. To all the newcomers who have never heard of me or what I stand for, understand that I am first and foremost a raiding healing Priest. It’s who I am and it’s what I want to do. Therefore, a majority of the columns I intend to write will end up in that subject area. If you look around my blog, you can see I write about a variety of topics such as guild management and raid leading in addition to being a Holy Priest. My current guild is up to Gurtogg Bloodboil in Black Temple and Hyjal is on farm. Now that you know a little about me, I have to ask you one question. What do you want to read about?